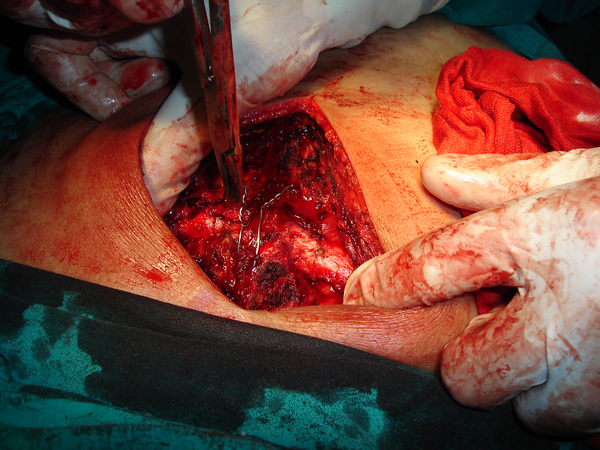 To Cite: Elkhayat H, Nousseir H. Fixing a Traumatic Sternal Fracture Using Stainless Steel Wires, Trauma Mon. 2016 ; 21(2):e27231. doi: 10.5812/traumamon.27231. Reported indications for fixation are variable as reports started with cosmetic reasons (1) then expanded to include the severity of the fracture and the difficulty of weaning patients from mechanical ventilation. The timing of fixations was classified as either immediate (occurring within a month after the injury) or chronic (performed at least 3 – 6 months after nonunion diagnosis). The decision to perform an immediate or delayed fixation was largely determined by the comfort and confidence of the surgeon (3). We postulate a modified classification taking into consideration the associated injuries, together with the severity of the fracture. - Severe pain, making respiration difficult. - Echocardiography is an important preoperative workup to exclude pericardial collection. - Supine position with a sandbag below the patient’s shoulders. - Use a malleable metal tongue retractor to raise the inner plate of the sternum and protect the heart and great vessels during insertion of the stainless steel wire’s needle. - Using an illustration of eight stitch or simple one stich according to the degree of displacement and available space to approximate (Figure 2). - In cases of comminuted fractures or where sliding fracture edges are reaching the inner plate of the sternum, where it will be difficult or lead to losing parts of the outer plate, one can use a No.2 delayed absorbable suture passing from the outer plate and coming up at the marrow of the sternum without reaching the inner plate. This is likely to be less effective than a full thickness wire suture but with a buttressing of the muscle flap, one can achieve satisfactory results. - Adjacent costochondral fractures are best sutured using delayed absorbable sutures with approximation of the two ends gently to prevent perichondreal injury. - Put a suction drain of appropriate size just above the sternum unless you put a chest tube for the already-opened pleura during the operation. - We routinely use a topical antibiotic above the sternum to guard against mediastinitis. - Extubation on a tabulation is the target unless there is associated lung contusion or other injuries requiring mechanical ventilation. - Patient is discharged home after control of pain and removal of epidural catheter and drain.